Download Sandvox 1.6.8 from this message — or you can just choose “Check for Updates” from the “Sandvox” menu in the application itself. If you have been using the Amazon List feature of Sandvox to display a Wish-List or Wedding Registry, we are sorry to report that Amazon . com is no longer supporting the display of these items on your list. You will need to rebuild your list by adding individual products. We are very sorry for the inconvenience — apparently Amazon . com felt that it was not cost-effective to provide that service to website owners. We have been encouraging Sandvoxers to instead use “web . mac . com” or “web . me . com” for a while now, so hopefully you are not affected by this change. Just in case you haven’t yet migrated your website to web . mac . com or web . me . com (or another domain entirely, such as one hosted by one of our hosting partners), now would be a good time to run your website through our Host Setup Assistant and re-publish it at a supported address. We are pleased to make Sandvox (regular edition) part of the MacGraPhoto bundle, “Nine Great Graphics Applications For the Price of One.” Along with Sandvox, check out other amazing apps such as Posterino, Hydra, ImageFramer, Layers. These are some great tools to build and manipulate images prior to bringing them into Sandvox. The MacGraPhoto bundle will close in about two weeks, early November 30. Check it out! Every month, our community of third-party Sandvox designers comes out with one or more new designs to tempt us all into giving our websites a fresh new look. This month is no exception — Blueball Design has released “Gravitas,” the design they use on their own website. 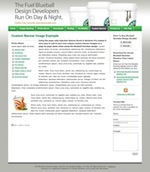 This wide design comes in five delicious-looking flavors, and costs US $12.00 for the package. Read more about Gravitas. Even better, for 72 hours, Blueball is making all of their individual designs (including Gravitas) available at a 50% discount. The sale, which has just started, runs through Thursday November 18 at 11:59 PM, U.S. Eastern Standard Time. Use the coupon code “blueballsandvox50sale” when you check out from Blueball Design. 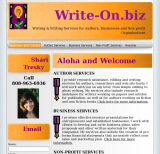 For a great primer on a well-written website, visit write-on.biz from Shari Tresky. The Sandvox design Ms. Tresky chose, “This Modern Life” quickly and succinctly conveys the writing services she offers. Its professional look informs the site visitor that she is a capable wordsmith and that she has the ability to produce a quality product. She has perfectly laid out her main areas of concentration, without an overwhelming level of content that can quickly return people to the search engines. Shari has written three short paragraphs with three sentences each as a hook for the reader. Her interior pages are more substantial and go into detail about the each of the specific areas of concentration. Still, she effectively uses bullet lists, short paragraphs and of course, her exceptional writing skills to develop interest in her content and confidence in her abilities. She clearly knows her craft. Want to see some really amazing photos of a little-known culture? We’re talking National Geographic quality photography. Check out George Simian’s Ubut, Bali Photography Workshop website. Mr. Simian conducts a workshop for photographers on this Indonesian island each summer and the results are breathtaking. The dark background of the customized Blueball Cubicle design is critical to framing the photos and enhancing the effect. Naturally it is helpful that the photographs themselves are of professional quality and utilize good equipment. He has displayed a number of thumbnail photos on each of the two interior pages, so the site visitor can easily scan them all. Clicking on a thumbnail takes you to a larger view of that image, with scroll controls that step you through these magnificent images. Be careful though: You just might find yourself heading for Orbitz to book a flight!